Massey was the first - and is still the only - University to offer degrees in Māori Visual Arts. All degrees at Toioho ki Apiti are taught with a strong Māori kaupapa, with te reo, tikanga, and manaakitang at their core. Toioho ki Apiti faculty recognise that language, culture, tikanga and art are intertwined and inseparable. We cater for all levels of proficiency in te reo whether you have grown up through kohanga and kura or are an absolute beginner. As a Māori visual arts student you will develop perceptual and conceptual skills in two- and three-dimensional art practice alongside a cultural foundation for verbal and visual communication. Exhibitions and community courses allow you to interact with the broader Māori community to further develop your awareness and understanding of relevant issues. Over time you will develop your own art practice that is deeply grounded in culture. As well as Māori, we have students of Pakeha and international indigenous heritage who want to explore a kaupapa-driven approach to contemporary art. The BMVA experience can be a rewarding and rich cultural encounter. BMVA students are encouraged to become involved in Māori cultural activities, including noho marae, waiata sessions, kapa haka, participation in powhiri, and attendance at hui. Third and fourth year students are required to exhibit their work in a professional manner. Their exhibitions are considered to be among the highlights of the year. They are held towards the end of the second semester and are open to whanau, the wider University, and the public. The standard of work has been uniformly high and attracts very favourable comment from visitors and art critics. Much of the work is sold during the exhibitions, introducing students to the commercial side of visual art and providing experience in marketing and presentation. When you join Toioho ki Apiti, you become part of the internationally recognised College of Creative Arts - ranked in the top 100 by QS University rankings, second in Asia Pacific for design concept by Red Dot. The College of Creative Arts is also NASAD approved as Substantially Equivalent. The BMVA is offered at Massey’s Palmerston North campus., which has many relaxed green spaces. Most BMVA students choose to be part of Manawatahi - the Māori Students’ Association on campus - and consider them to be whanau. There is safe student accommodation available on site. Toioho ki Apiti has a particularly strong, long-standing relationship with Te Manawa in Palmerston North; the gallery regularly hosts exhibitions of work by students, staff and alumni. We also offer opportunities to visit art galleries, museums and cultural events in other centres. $5000 each for up to 10 students. Apply by 30 November. We offer $5000 scholarships for first year Māori Visual Arts students. For details of this and other scholarships, check the College of Creative Arts website. There is more detail under the “Planning” tab at the top right of this page, and at creative.massey.ac.nz. The Application due date to start in February 2019 is 1 October. Late applications will be considered subject to space being available. 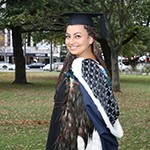 From art student to television presenter, Massey University graduate Puawai Taiapa-Aporo has found her groove, thanks to her Bachelor of Māori Visual Arts. Puawai’s role as presenter on iconic youth television show Pūkana grew from her passion for performance art developed at Massey.